What is the 'Prague Café', and why has it become the Czech President's insult of choice for his opponents? President Zeman first used the term publicly last year as a reaction to demonstrations that took place in the center of Prague on the day of the twenty-fifth anniversary of the Velvet Revolution calling the demonstrators the “raging Prague lumpencafé”. Czech president Milos Zeman is currently halfway through his first presidential term and it has become more than obvious that his divisive election campaign was not just a calculated move to secure victory, but an enduring political tactic. The divisions that Zeman aims to foster do not copy class or social status lines, nor are they set along party lines – he distinguishes simply between the “self” (himself and his supporters) and the “others” (his opponents). Zeman is showing little determination to conduct any consensus-building and seems to be constantly working on preserving a separating line between his perceived opponents, which he abhors, and his supporters. This persistent reiteration of dividing points inherently strengthens the positions of both camps (i.e. opponents increase their opposition and supporters increase their support) and translates into deepening divisions within the Czech society. To be fair, every politician has a camp of supporters and opponents, no public figure is admired by all. Yet, not that many politicians in Western democracies devote so much thoughtful effort into further widening the gap between their supporters and opponents and instrumentally turning them into two irreconcilable groups as president Zeman. To navigate his tactic in public discourse, Zeman – with the help of his agile spokesperson Jiri Ovcacek – has recently formulated an ingenious term that encompasses all his opponents (and thus the opponents of his supporters) and permits him (and his team) to use this metaphor as a clear signal to his followers – the term is “Prague Café” and deserves a brief etymology. President Zeman first used the term publicly last year as a reaction to demonstrations that took place in the center of Prague on the day of the twenty-fifth anniversary of the Velvet Revolution. Protestors held up mock red cards that were addressed to the president, calling for him to step down. Zeman called the demonstrators the “raging Prague lumpencafé”, perhaps referring to Karl Marx’s term lumpenproletariat, which described the social groups which were of no use to the collective cause of the proletarian revolutionary struggle. Since its first use, Zeman simplified the term to “Prague Café” and thus gave way to a metaphor that acquired a prominent role in the contemporary discourse emanating from the Prague Castle. How does the term resonate in the Czech mind? First of all, we can decompose the notion and observe each word separately. Prague is the capital city and as any capital in any other country it is perceived by the rest of the nation as having too many extra perks and benefits which the rest of the state does not have, where the average wages are significantly higher and where the nation’s (self-styled) “elite” resides. The café is then placed in stark contrast with the Czech pub, as the culture of beer-drinking in the country is strong. 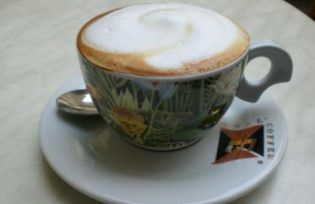 In this sense, the café is where the relatively well-off come to chat, smoke cigarettes and drink wine or espresso. They have enough time to sit around (as opposed to the hard-working rest of the nation) and chat about politics and society, yet their small-chat leads to meaningless conclusions and is just for show. In conjunction, the two words create a pejorative metaphor that aims to form in people’s minds a picture of a group of metropolitan-based, elitist (pseudo-) intellectuals, who claim themselves to be the arbiters of conventional wisdom, who are dogmatic in their political and social views, intolerant of the less well-off and who are a priori opposed to dissenting opinions. Given the fact that they are mostly isolated within their “café communities”, they lack the rational and practical outlook and experience of the hard-working man, who simply does not have the time to endlessly conspire about social and political ills of the country over a glass of red wine. In British political jargon, Zeman’s notion roughly corresponds to the so-called chattering classes, which often refer to the liberal elite, but also to pundits and journalists. The “Prague Café”, however, can also describe something a bit more obscure – that is, political conspiracising of Prague intellectuals. 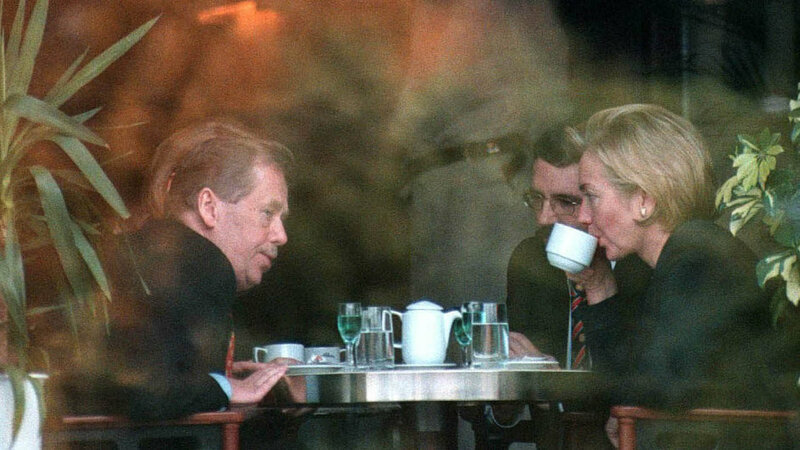 This photograph (published often by Czech media and thereby well-known to the average Czech) of former president Vaclav Havel and Hillary Clinton sitting and discussing in a renowned café in the center of Prague is a picture that falls directly into framework of Zeman’s “Prague Café”. From this perspective, the metaphor is subtly attacking the politico-intellectual legacy of former president Havel. Even though Zeman has not been as explicitly critical of Havel as, for example, Vaclav Klaus (president 2003–2013), he has never been comfortable with following Havel’s course in foreign policy centering on human rights and democracy promotion – this is mainly due to Zeman’s goal of strengthening economic and political ties with China. Moreover, Zeman, whose islamophobia is well-known, aims to create the illusion that these decadent intellectual forces can have destructive effects on the Czech state as such. It is the cosmopolitan and irresponsible “Prague Café” that would be willing to accept an unlimited amount of refugees in the country, who would hence “apply sharia law, stone unfaithful women to death and cut of the hands of thieves”. When asked whether the refugee crisis divides Czech society Zeman replied that it does not: “on the one side there is the ‘Prague Café’, on the other side is ninety to ninety-five percent of the Czech society”. Implicit in this statement is the claim that the moral and ethical values of the “Prague Café” have become detached from everyday life. Broadly speaking, members of the “Prague Café” could be journalists, artists, students, pundits, political commentators, NGO activists and citizens who have in one way or another opposed or spoken against the president. If one agrees with the president on some issues and then agrees with the “Prague Café” on other issues, does that make him a member of the metaphorical group? This is where the trick lays. The president has only vaguely defined of what he means by the term, thus providing enough leeway for everyone to envision his or her prototype member of the “Prague Café”. Therefore, all the social forces that Zeman’s supporters despise can be molded to fit within the confines of this inflatable metaphor. In terms of public relations, the new term has greatly facilitated the communication between the president and the public. Anytime the Prague Castle speaks of the “Prague Café”, it is a rallying call for the president’s supporters that the issue discussed is something to take notice of, fight for and protect against the “loud-minority”. At the same time, the “Prague Café” can be easily blamed for distorting the public discourse. For Zeman’s supporters, any criticism of the president published in the media is rendered irrelevant because it was conceived and conspired by the fundamentalist “Prague Café”. The term has thus quickly infiltrated mundane speech and is now being comfortably used in blogs and political discussions as a terminus technicus. There are no signs of Zeman refraining from this discourse. Just last month when members of a recessist art group bypassed the Prague Castle’s security and took down the presidential standard flag and replaced it with giant red trunks, spokesperson Ovcacek reacted by saying that the “Prague Café” is increasingly fascist (which is another word, perhaps inspired by Vladimir Putin, that is recently finding more inroads into the Prague Castle’s dictionary). Similarly, when Zeman visited a regional city and three thousand local citizens came to the town square to hear his speech, Ovcacek posted a tweet saying that the rally was a “slap in the face to the ‘Prague Café’” (Ovcacek has also identified Twitter as the main communication channel of the “Prague Café”). The question remains whether the frequent use of the term by the Prague Castle will not lead to the notion’s hollowing-out and subsequent downfall. Nevertheless, it is likely that as the next presidential elections slowly approach, the use of the metaphor will intensify. Jan Hornát is a lecturer at Charles University in Prague and Associate Research Fellow at the Institute of International Relations, Prague.